We showcase our assumptions, biases, and default settings every day with the words we choose and the choices we present to others. Sometimes we can’t see it when we’re looking straight at it. Parking is currently unavailable on EVENT VENUE. Several public parking garages located nearby offer convenient options, space permitting. LIST OF PARKING GARAGES. In addition, street parking may also be available in front of EVENT VENUE. Note that this was in Seattle in a central tourist-heavy location. The likelihood of motor vehicle parking being available directly in front of said venue can be calculated precisely as zero raised to infinity; transit service is available; and the city has multiple bikeshare operators. If you’re going to be talking about taking action for sustainability, it starts here, where your invitation invites and includes everyone and doesn’t encourage driving alone. You don’t need (just) parking information — you need transportation and accessibility information. Our event venue has bike parking available or You’re welcome to bring your bike inside for secure storage. If their personal bike is the way someone arrives, it needs to be there when it’s time to depart. Parking information matters for people who bike just as it does for people arriving in cars (and takes a lot less room to accommodate). Bikeshare available: If your venue has a nearby bikeshare station, note this. If your city has dockless bikeshare you can point to the apps and remind them to leave the bike parked in an appropriate location when they leave it for someone else to use. Pro tip: If you don’t know if the venue has bike parking or how they’d handle indoor bike storage, ask. You might be surprised at the answer — hotels, for example, can check bikes with the bell service just like luggage. Our event venue is/isn’t accessible via public transit. In a rural area it is quite possible no transit service is available. If it is, list it (which route numbers serve this location? How frequent is the service?). Transit timing matters: Schedule your meeting so timing of nearby transit service doesn’t require people to either arrive late or, alternatively, arrive ridiculously early and pay for event attendance with their time. Schedule the end of the meeting so people can catch the bus. Walkability to/from transit stops: Are there complete sidewalks with curb cuts? Good pedestrian-scale lighting? Does the street feel comfortable for everyone to use? If you want to coordinate ridesharing with others coming to the event…. If they’re all colleagues of some kind, you can put out a call for carpool drivers and send a follow-up with their contact information, or create a shared spreadsheet in the cloud to make it easy for people to share information to connect. Point people to an event invitation forum where they can post their interest in riding with others or willingness to drive. Point to apps that let them do the same. Whatever you choose, this is about people not being expected to drive alone. Last — and by last I mean least — Parking information. Everyone who does need that information is amazed and gratified that you thought to include it. You are super-cool. You’ve signaled a social norm: That people get to places using all kinds of modes. You’ve even provided a bit of a behavioral hack, planting a seed that might bloom into a carpool or someone’s first bus ride (when they realize that lets them skip all the parking hassle and expense). Of course you’re holding this event in a location that meets the requirements of the ADA for universal accessibility. Right? And you’ve looked at the venue and the approaches to it to understand where and how they may fall short of true accessibility no matter what they say. They neglected to mention the lip at the doorsill. The sidewalk doesn’t have curb cuts for wheelchair users or directional elements for people with low/no vision. It’s an old building that got an exemption from the elevator requirements. There aren’t any marked crossings or signals and the building is on the opposite side from the bus stop on a street with heavy, fast motor vehicle traffic. 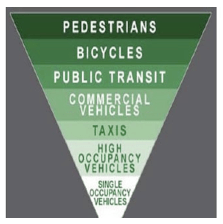 If you don’t need these elements or you rely on driving you may not notice the barriers. The list of design elements needed to make a location accessible is too long for one blog post. Your responsibility as an event planner is to think about who you’re including and excluding and do the research to know what to look for. Then tell people in the event information. 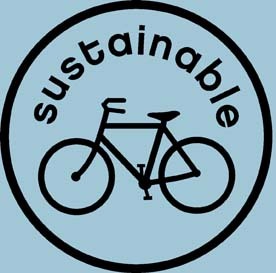 By explicitly listing those cleaner transportation choices, by the way, you’re doing more for a sustainable future than you will going after a ban on straws, just to tie transportation, sustainability and accessibility together with a nice tight bow. Oh, and if you’re assuming the people who ride bikes are completely separate from the people with dsabilities, don’t. Bicycling is easier than walking and a bike may serve as an assistive mobility device. There. Now you can start talking about a sustainable world for everyone. ‘A rolling walking stick’: why do so many disabled people cycle in Cambridge?